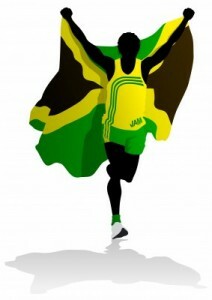 When Usain Bolt won the 100m Final on Sunday night Jamaicans across London erupted in celebration. Bolt’s win, with Blake in second and Shelly-Ann Fraser-Pryce winning the women’s 100m final confirmed Jamaican athletes’ status as the world’s fastest. Jamaica won gold and silver and the 100m final giving the country even more to celebrate on the 50th anniversary of their independence. Massive celebrations were taking place last night at Jamaica House, set up for the games at the O2 Arena in London. There was reggae music playing, bars serving Jamaican drinks and spicy jerk chicken and an ecstatic crowd of people. Unsurprisingly Bolt was also very happy with is win he believes that he “showed the world that I am the best” but says that he will need to win the 200m to go down in history as a legend. Bolt also said that he was more pleased with this win than Beijing four years ago due to the challenges he has had this season and the doubt over his ability to win again.